What is Crowdfunding and Equity Crowdfunding? What are the Benefits of Equity Crowdfunding? Crowdfunding is the term generally used to describe a person or company raising funds from a large number of people (the crowd). Crowdfunding has been fuelled by the growth of the internet, allowing people who previously could only reach small networks and sums of money to now reach much wider audiences and in turn raise more money. When a business raises funds in return for equity/shares in that business. Seedrs is an equity crowdfunding platform. When a large group of investors all make a small contribution to a company or person who is looking to borrow money, in return for that loan being paid back with interest over time (otherwise known as peer-to-peer lending). Funding Circle and Zopa are two popular peer-to-peer lending platforms. When people invest in a project they are passionate about, in return for some reward (usually non-monetary) such as getting a product, free tickets/gifts, or recognition in some way. Kickstarter and IndieGoGo are two popular reward-based crowdfunding platforms. When people donate money to a specific (usually charitable) cause. JustGiving is a leading donation-based crowdfunding platform. Equity crowdfunding is when a company raises funds from a large number of investors (the crowd) in exchange for equity in that company. For the individual investor, this means that when they invest they become shareholders in the company. What makes this different from the other types of crowdfunding? With rewards, donation and debt based crowdfunding, when you pledge funds you do not own any part of that project or company. With equity crowdfunding, when you pledge or invest, you become a beneficial shareholder of that company and can enjoy the benefits (and risks) associated with that, outlined below. For investors, equity crowdfunding allows them to buy into a business they believe in, and to therefore have a financial share of the rewards of any potential success of that business. When investing in early-stage businesses, you should be aware that your capital is at risk. Some of the associated risks are outlined later in this article. How does this work? When you invest via equity crowdfunding you are purchasing shares in that business. If the business performs well, the value of those shares may rise. If you decide to sell those shares one day, you will profit from the increase in value on those shares. Say, for example, a company called StarTech, is raising money via equity crowdfunding, and you wish to invest. StarTech prices it’s shares at £10 per share, and you invest £100. This means you buy 10 StarTech shares (£100/£10 = 10). Your investment was a savvy one and StarTech grows fast over the next 5 years, such that the company’s value increases tenfold. The 10 shares you bought for £100 are now worth £1000. Prior to equity crowdfunding platforms like Seedrs, unless you were a high net worth individual or a company director, there was no easy way to invest in startups and early-stage businesses. The next closest thing, reward-based crowdfunding, allowed you to financially support a project or business, but had no mechanism for allowing you to financially share in the success of that business. Equity crowdfunding has opened up investing in startups to everyone, not just the high net worth individuals and institutions. It gives everyday people the ability to discover and invest in exciting, early-stage, growth focused companies alongside venture capital firms and other institutions, follow their journey, and financially benefit if those companies are successful. With Seedrs, you can start building a portfolio of investments in growth-focused companies from as little as a £10 investment. For startups and early-stage businesses, equity crowdfunding enables you to raise capital from a wide and diverse pool of investors, often alongside institutional investors (such as venture capital firms and family offices) and angel investors. What are the Benefits of Equity Crowdfunding for Businesses? Equity crowdfunding connects businesses that are looking for cash with a crowd of people who are looking to invest. It can also make raising capital a very quick process – the average campaign on Seedrs hits its target in just 30 days. An equity crowdfunding campaign can give your business fantastic exposure. Aside from putting your business in front of large audience of people who may not only invest, but also become customers, a campaign is a great way to tell your story, generating PR and additional brand awareness. At Seedrs we offer marketing and PR support as standard to ensure your crowdfunding campaign is impactful and effective. You can learn more about how we help businesses to raise funds here. An equity crowdfunding campaign provides the opportunity for a business to engage their customer base by offering them the opportunity to buy into the business. In doing so you can not only build customer loyalty but also turn your customers into ambassadors for your brand. What should you look for in an equity crowdfunding platform? A secure, regulated digital platform to host your raise simply. 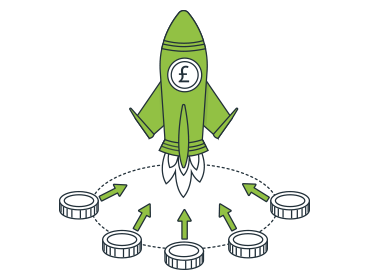 Seedrs is a trusted platform that enables you to build an investment round, pitch, manage the transaction and hold funds. We also provide the documentation and clerical work related to your round. A platform that minimises administrative work. Managing large numbers of investors can be a concern for those considering equity crowdfunding. At Seedrs, we take the stress out of this by consolidating all investors into one shareholding using a nominee structure. Seedrs acts as the legal representative of all Seedrs investors in campaigns, meaning that entrepreneurs only need to deal with Seedrs for administrative matters rather than having to contact hundreds of scattered investors. Find out more about this structure here. Access to a network of savvy high-net-worth individuals who will invest in your company. At Seedrs, all our investors have to pass authorisation and demonstrate their level of understanding of how investments work, showing us that they have the professional judgment and understanding to appreciate the risks of investing in private companies. As a result, when your campaign goes live on Seedrs, you’ll get access to a large network of people who can accurately assess the potential of your business. What are the Risks of Equity Crowdfunding? If the business fails, you will not get any of your money back. Similarly, if the business performs poorly and there is an exit, you may receive back less than your initial investment. Even if a business succeeds, investors are unlikely to be able to sell their shares or receive dividends for a number of years. An investor will only be able to sell their shares when there is an exit, such as the company being bought or becoming publicly listed. Seedrs does however operate secondary market, allowing Seedrs users to buy and sell shares and therefore realise their investment returns earlier than in other circumstances. When investing in an early-stage and growth focused business, it is likely that the business will require further capital in the future, and therefore issue more shares in return for capital. When it does this, the percentage of equity held by earlier investors will decrease, unless they decide to invest again.